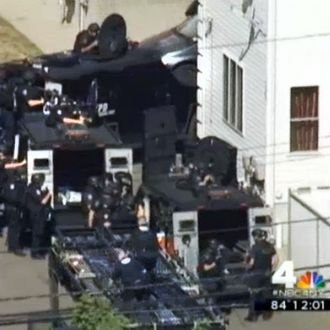 A six-hour standoff between federal marshals and the Staten Island man they hoped to arrest early this morning is now over. The man — who barricaded himself inside his basement apartment before setting it on fire — shot at officials with an assault rifle (wounding one firefighter) and posted Facebook updates while the standoff was ongoing; he is now dead. Authorities have not yet confirmed how the man died, although reporters and residents nearby heard many gunshots shortly before officials announced the standoff had ended. Thirty-eight-year-old Garland Tyree was the founder of Real Write Publishing, which, according to its website, is "dedicated to bringing you realistic Urban Fiction, filled with action, drama and most of all thought provoking material." He had 18 prior arrests and several felony convictions. Federal marshals reportedly were arresting him this morning for violating his probation. 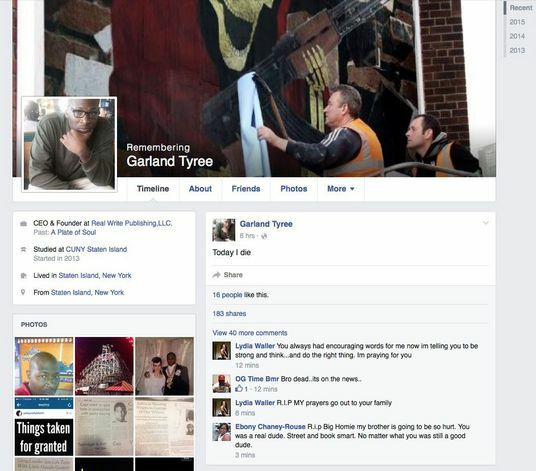 An hour after the marshals showed up, he posted a short message on Facebook: "Today I die." His friends quickly responded, first saying things like, "U will never die bro," and then posting links to coverage of the standoff. "They kicked in my door and it popped off," Tyree responded. The Staten Island Advance reports that Tyree’s family is at the scene, yelling at police and crying. The family members were brought to the apartment to help NYPD’s hostage negotiators. The officers managed to talk to Tyree a few times on the phone before he hung up, saying his cellphone battery was low. Police Commissioner Bill Bratton was also in Staten Island at the end of the standoff. Mayor Bill de Blasio went to Richmond University Medical Center this afternoon to visit Jim Hayes, the firefighter shot in the leg and buttock outside Tyree’s apartment. The firefighter, who has worked for FDNY for more than 30 years and was at ground zero after 9/11, is expected to make a full recovery. Fire Commissioner Daniel Nigro told reporters that Hayes was the first firefighter shot in the line of duty in 21 years.